Top Rated Local® is pleased to announce that Louie’s Cleaning & Disaster Restoration is a 2019 award winner for restoration companies in South Dakota! Don’t let water damage plague your home; for expert restoration services in Vermillion, choose Louie’s Cleaning & Disaster Restoration. Louie’s Cleaning & Disaster Restoration has received dozens of reviews on three verified sites with an average rating of 4.91 stars, earning them a remarkable Rating Score™ of 95.13 and a 2019 Top Rated Local award for ranking among the top 10 restoration companies in all of South Dakota! “Anthony and his team are wonderful to work with and do a fantastic job! They are professional, courteous and thorough. Whether it’s carpet cleaning, duct cleaning, clean up after a water leak, etc., they make the process smooth and easy. [I] would definitely recommend them!” – Jami B.
Anthony Edelen, the owner of Louie’s Cleaning & Disaster Restoration, generously gave us a few minutes of his time to tell us about his award-winning business and its superb online reputation. Outside of building a powerful online reputation, Louie’s Cleaning & Disaster Restoration has spread the word about who they are and what they do through advertising in the local paper, getting involved and networking in their community, and donating to different organizations. Congratulations to the team at Louie’s Cleaning & Disaster Restoration for being a 2019 Top Rated Local award winner, and thank you so much, Anthony, for taking the time to speak with us! 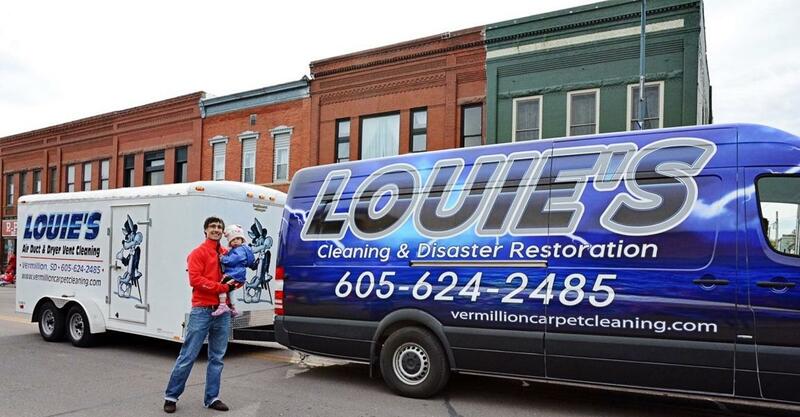 We highly recommend Louie’s Cleaning & Disaster Restoration in Vermillion. Visit their website today!